You know you’re in trouble when the master of structural adjustment says enough is enough. In a spectacular display of widening popular discontent, strikes and anti-austerity protests broke out across the eurozone on November 14—the first time there has been broad coordinated action in multiple countries simultaneously since the beginning of a crisis rooted in the design failures of the European Monetary Union. General strikes in Spain and Portugal closed car plants and shut down other industries, drastically curtailing mass transit from Barcelona to Lisbon. There were strikes and huge demonstrations in Greece and Italy. Even in France and Belgium, countries less immediately threatened by the creeping debt crisis, big rallies were staged. 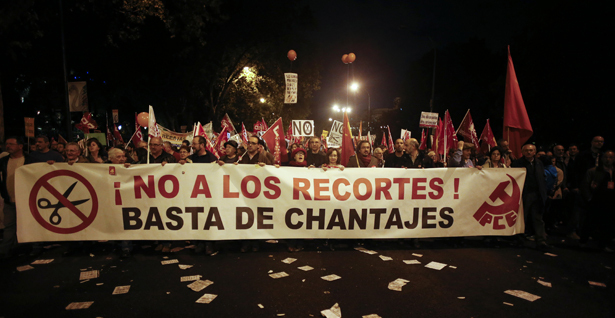 In Madrid, hundreds of thousands of protesters flowed past the Prado for five hours. Many seemed newly aware of a common European struggle. Some waved blue-and-white Greek flags in solidarity with the victims of the most ruthless shock therapy pursued so far. Others held placards painted with Iceland’s national colors, suggesting that the Icelandic default might show the way for the debt-laden euro periphery, especially Greece. In Portugal and Greece, as in Spain, protesters took aim at the IMF as well as German Chancellor Angela Merkel. “IMF means hunger and misery,” was a slogan in Lisbon. “We are fed up to our ovaries with the IMF,” joked a feminist contingent at the Madrid demonstration. Yet the truth is that IMF leaders, themselves frustrated with austerity madness, might have grabbed a banner and joined the protest. A very public dispute has erupted between the fund and the European Union over the pace of fiscal adjustment and the need for a second restructuring of Greek debt. At its semiannual meeting in Tokyo in October, the IMF announced that the austerity packages applied throughout Southern Europe since 2009 have been counterproductive, undermining economic growth and increasing rather than bringing down public debt ratios. Greece provides ghastly proof of the failed logic of the euro orthodoxy. After three years of shock therapy, the Greek economy is in depression and will have shrunk by more than 22 percent at the end 2013, the IMF warns. Employment in Greece has fallen to 1980 levels, and Greek debt dynamics have only deteriorated. Public sector debt has soared from 144 percent of GDP in 2010 to 170 percent, and unless the official lenders agree to take a haircut in a controlled restructuring of debt—as private lenders did earlier in the year—Greece may be forced to leave the euro. “The IMF has admitted the blunder, but tell that to the Greeks,” said Zoe Lanara, international relations secretary of the Greek General Confederation of Labor at a conference organized in October by left think tank TASC in Dublin. In other words, overzealous fiscal adjustment cripples an economy, driving down tax revenues, forcing up welfare costs and causing more debt problems. While labor unions and sections of the European left have expressed concern at the impact of austerity on growth since the very beginning, “a year or so ago, most finance ministers didn’t even know what fiscal multipliers were,” said Terrence McDonough, a Marxist economist at the National University of Ireland. Despite applause from Brussels and Berlin for its steady progress in deficit reduction, Ireland holds sobering lessons. Its exports have helped it avoid outright depression, but with debt at around 140 percent of GNP, Dublin may be as close to insolvency as Athens, warn the unions. “We are in the sixth year of contraction of domestic demand, and they are still cutting spending. If the IMF is right and multipliers are 1.7, this will be devastating for Ireland,” said Michael Taft of the Irish union Unite. The IMF 2013 forecast for Portugal, meanwhile, has been revised downward to a full-blown recession with a 3 percent fall in GDP. Only Latvia—recovering strongly and keen to join the eurozone after its own dose of shock treatment—remains to vindicate the EU orthodoxy’s penchant for austerity, wage cuts and internal devaluation. Yet the tiny Baltic state was close to expiring on the operating table, losing a quarter of GDP and one-seventh of its youth to emigration. Even with its current growth rates, it will take five years to get back to where it started. Notwithstanding the discouraging evidence from the eurozone, pressure is being piled on the Obama administration to agree to a “grand bargain” of fiscal consolidation with the Republicans in Congress. Here, too, the IMF has warned that a front-loaded fiscal adjustment could abort an already weak recovery. Given that interest rates on US bonds are at rock bottom, Congress could instead be legislating public investment programs at virtually no cost. “The European monetary union has created its own constraints and needs to be overhauled, but the US should be using fiscal policy to boost growth,” says Greek economist Dimitri Papadimitriou, president of the Keynesian Levy Economics Institute at Bard College. The IMF’s methodology, at least, is being hastily adapted to the landscape of destruction and strife across the EU periphery. Yet it is still not clear that the European leaders will change tack. In Greece, the troika ordered more than 9 billion euros’ worth of cuts and tax increases, which, if multipliers are indeed 1.7, will reduce GDP by another 8 percent. Meanwhile, as Spain prepares to request a bailout package that will activate the European Central Bank’s bond purchasing program, the troika teams in Madrid appear to be designing something similar to the disastrous Irish program. The troika had raised hopes with a promising commitment to recapitalize Spain’s banks, but it now appears that so-called legacy debt—the bad loans inherited from previous bubbles—will not be covered. This means that in Spain, just as in Ireland, the state will be left to provide the capital needed to help banks absorb the impact of a deteriorating housing market. This will feed what the IMF calls a “pernicious feedback loop” where bailouts to stricken banks undermine public sector finances. As Spain slides further into recession (the IMF forecasts a 1.3 percent drop in GDP next year, after a 1.5 percent contraction in 2012), concerns about debt sustainability will deepen and the bank will be forced to intervene at increasing intervals against a backdrop of mass unrest. That is a recipe for backlash in Germany that could end the eurozone once and for all. Andy RobinsonAndy Robinson is a reporter for the Barcelona daily La Vanguardia. Now on assignment in Latin America, he is the author of the book Un Reportero en la Montaña Mágica, on Davos and inequality.